Besant Technologies offers Best Data Science Training in Bangalore at Marathahalli, BTM Layout, Rajajinagar, Kalyan Nagar, Electronic City & Jaya Nagar. We teach Data Science Course to the students from basic to advanced concepts, that too in a real-time environment. We Offer Best Data Science Courses in Bangalore with 100% Placement Assistance. We rated as the No 1 Training Institute for Data Science/Analytics Courses like data science with Python, data science with R, data science with SAS, and data science with Excel. From this Data Science Training in Bangalore, you will get real time exposure in statistics, Machine Learning, Deep Learning, Tensorflow, Artificial intelligence and machine learning algorithm Concepts. In order to gain expertise in the field of data science, you need proper training. Now, the question that arises here is- where to get this training from? Well, although there are many institutes that offer data science courses, there is nothing more beneficial for your career than taking Data Science Training in Bangalore from Besant Technologies. Other Data Science Training Institutes in Bangalore might not take a student-centric approach of training candidates. But for Besant Technologies, every student is special and important. With hands-on experience as well as theoretical training, Besant helps you grow as an IT professional. Through high-quality Hands-on Training, Besant Technologies makes sure its students can efficiently work on data science linked projects later in their professional life. By emphasizing on practical sessions, Besant Technologies sees to it that you witness and acknowledge the applicability of all the theoretical concepts you learn. By being acquainted with all the latest IT trends in the field of data science, you will feel confident and be able to make it to any top-notch IT company. There is indeed no shortage of Data Science Course in Bangalore, but Besant Technologies prepares you from all aspects. It’s not a good practice to enroll yourself with any random Data Science Training Center. After all, not all institutes are genuine or certified. 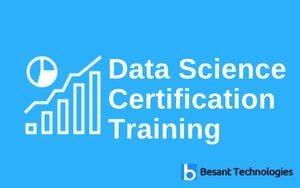 But Besant Technologies is reliable and it does everything in its stride to present you a bright career by our data science training in bangalore . The world has been taken over by big data. And with the foothold of big data growth in the world, the need for its storage began to grow. Enterprise industries saw it as a challenge till somewhere around 2010. At that time, more emphasis was being laid on building solutions and frameworks for the storage of data. Then came frameworks like Hadoop that indeed solved the problem of data storage. But then a new problem arose- processing of this stored data. Here comes the role of data science. In Hollywood sci-fi movies, you see a lot of seemingly unrealistic ideas. Believe it or not, all such ideas can be turned into reality with the help of data science. In another way, you can say that the future of artificial intelligence lies in data science. And that is probably the reason why data science and its courses are so much in demand. People want to learn it for lucrative IT career options. So, data science, which is a concoction of machine learning principles, algorithms, and various tools, is used to figure out concealed patterns in raw data. It is because of data science that data can be used to add value to any business. Predictive causal analytics, prescriptive analytics, and machine learning are the elements that together render data science helpful in making decisions and predictions. Here, it would be valuable to add that the future lies in the hands of data scientists. The need for data scientists that have expertise over the subject is growing with each passing day. What more? Well, data science is changing the way people look at the world flooded with data. Get our the best Data Science training in Bangalore. Why Should I take Data Science Training? If you want the Best Data Science Training in Bangalore, then resort to Besant Technologies. But one thing that must have intrigued your interest is the fact that so many people across the world take training in this course. Alongside, you must have wondered why people show this craze. Well, Data Scientist Certification Training Bangalore or any other place for that matter is popular because of the immense popularity of the course itself. Yes, data science is an extremely valuable course and companies around the world are always on a lookout for serious and expert data scientists. Hence, people look to train themselves in this field. In fact, you can boost your career considerably by taking pertinent and Practical Data Science Training in Bangalore. why should one take a data science course? Data is everywhere. And you can get any kind of information over the internet. In fact, there is a kind of data explosion today. This data is of no value, without proper science to analyze and process it. This is where the role of data science comes into play. With a Real-Time Training in data science, you will be able to be of immense value to someone who needs to capitalize on data. Almost every industry is now on a lookout for new market opportunities for their services and products. And this has definitely resulted from the toughening market competition. A lot of companies believe data science can make their business performance improvement. The field of data science has lucrative career options. You can get an amazing job by being trained in data science. Data science jobs are also extremely high-paying. So, if you want to join an IT course just because you want to make some good money, then learning data science would be the best bet. Data science is not a course to be learned by advanced learners alone, even beginners can learn it. Hence, no matter what level of expertise you boast of, you can always take training in this course. Why Go for Data Science Training in Bangalore at Besant technologies? Data Science training Bangalore at Besant Technologies can help you build an enviable IT career. We have incessantly been putting in efforts to pinpoint the possibilities of data science in the IT world. And that is probably the reason why we have been able to earn a good name for ourselves in the market. We are an experienced institute with a lot of desire to see our students scale great heights in the field of IT. And we leave no stone unturned to make sure our students get trained in a way that they can bring name and fame not just to themselves and their families but also us. We boast of some of the most experienced and knowledgeable trainers in Data Science course, having a great proficiency in theories and immense empirical knowledge. And guess what, they train students by applying a student-centric approach to teaching. As a result, they have always been successful in ensuring satisfactory learning outcomes in trainees. Our data science courses are another reason why people render us the Best data science training institute in Bangalore. They are suited to all kinds of learners and have been designed keeping in mind the needs, standards, and expectations of the industry from data science-trained people. We leave no stone unturned to keep you at the forefront of technology and see to it that every tiny bit of information you receive from us is correct and relevant to the present-day world. We offer Data Science Online Training for US People with Certification. Before Joining the Online Training you can attend Data Science Demo Classes with free of Cost. Pay the tuition fee Once You Satisfied with the Sample Class. We assured that Our Data Science with Python/R/SAS/Excel training will be 100% Practical Oriented. Besant technologies Offer Corporate Training for Data Science/ Analytics Related Courses. We Used 15+ Years Experienced Trainers for Corporate Training. Our Top Clients are Infosys, TCS, Cognizant, Google and Microsoft. Data science is growing in its popularity with each passing day. Data processing becomes a breeze with it, after all! Since there is a growing demand for data in every field, the pertinence and value of data science are also parallelly increasing. And that is probably the reason why so many people across the globe are showing interest towards this subject. At Besant, we provide Classroom Training, Online Training and Corporate training to anybody who is interested. What else? We offer reliable Placement Assistance to all our trainees. After you have completed the data science certification course, you will feel confident enough to consider yourself a reliable data science expert. The work opportunities available for a data scientist are numerous. Some of the most crucial job positions you can hold as a data science professional include data analyst, data engineer, data science generalist and machine learning engineer. Most of the Top MNC offering more than 10 Lakhs per annum for junior Data scientist and above 20 Lakhs Per annum for Senior Data Science Professionals. After you complete the data science course at Besant, you will be awarded a course completion certificate. We are an authorized Pearson Vue and Psi. If you have any interest in global certifications, then take the tests at our centers without doubts and apprehensions. We are Offering Data Science Courses with Python, R, SAS, and Excel in Bangalore with low Cost. Data Science Training with Excel in Bangalore fee – 18k Including GST. Call us 9108126341/9108126342 for free Demo Session on Data Science Training in Bangalore BTM & Marathahalli get 1 hour basic knowledge on Data Science Topics. I always wanted to do something in the field of data science/Analytics. But I was not being able to find out a good training center. Then an ex Besant Technologies student told me about this institute. Besant Technologies has trained me in data science in Kalyan Nagar Bangalore so well that I was reined in by the first company that interviewed me. I feel confident and blessed today. All thanks to Besant Technologies! I never thought I could be a part of the IT world, given that I was not from a science background. Thankfully, Besant Technologies for data science training in Bangalore for doesn’t need you to have any special educational background. The faculty members here taught us data science concepts so well, that never for a moment I felt I was no way related to technology. Now, I have joined an IT MNC. And working in a good position. I am an ex Besant Technologies student. Although I liked everything about the coaching center, I especially loved the way the trainers impart the course lessons. They not just emphasize theories but also practical. With regular practical training, I have learned a lot about the subject and its applicability. This has immensely helped in my job. Bangalore is a hub of coaching centers. Being able to find a good institute from the crowd is indeed challenging. It took me a lot of time to zero in on one particular organization for data science training. But then I am glad I chose Besant Technologies. Besant Technologies has a big contribution in whatever I have achieved in life. I am inclined towards IT. And that is why I wanted to take data science training from a good coaching center. When my friend told me about Besant Technologies, I did give it a second thought. But after some calculation, I went ahead and joined it. I feel thankful for myself that I did that. There is perhaps an institute that focuses so much on individual trainers’ learning and progress. Besant does, and that’s why it is different! Besant Technologies Reviews have given by our students already completed the Data Science training in Bnagalore with us. Please give your feedback as well if you are a student.